Air circuit breaker in which high pressure air blast is used for arc extinction between its contacts is known as air blast circuit breaker. Firstly, flow of high pressure air push away the moving contacts. It separate the contacts of circuit breaker and an arc is structed between them. Secondly, the air blast cools the arc and sweep away the ionised particle present between contacts. This increases the dielectric strength of medium. Consequently, the arc fail to reestablish and flow of current is interrupted. – Axial blast type: In which the flow of air blast is directed along the arc path. – Cross blast type: In which the flow of air blast is perpendicular with respect to arc. – Radial blast type: In which the air blast is directed radially. Under normal condition, the fixed and moving contacts are kept in a closed position by spring pressure and the air valve is remain closed. When a fault occur, a stripping impulse is produce which causes opening of air valve and high pressure air enters to the arcing chamber. This air pushes away the moving contacts against spring pressure. As the moving contacts separates, an arc is structured between them. At the same time high pressure air blast flow along the arc and sweep away the ionised particles. This increases the dielectric strength of medium, as a result of it the arc fails to these re-strike and flow of current is interrupted. The final gap between contacts for arc interruption is very small. Hence system voltage may sufficient to ionise the medium between contacts. To avoid this, an isolating switch is included as a part of this circuit breaker. This switch opens immediately after the fault interruption, to provide necessary clearance for insulation. The isolating switch is not needed for low voltage. Under normally conditions, the moving contact is connected with the fixed contact and air valve is remain closed. When a fault occurs, the moving contact is separated from the fixed contact and an arc is structed between them. At the same time high pressure air will forcefully take the arc into exhaust chamber where the splitter plates causing lengthing and cooling off arc. Thus the arc is extinguishes quickly. The principle used in radial blast type air circuit breaker is almost similar to axial blast air circuit breaker. 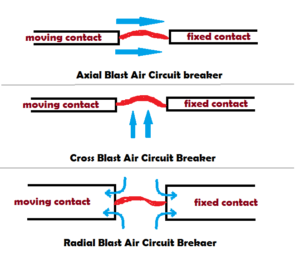 Axial blast circuit breaker may single blast or double blast. 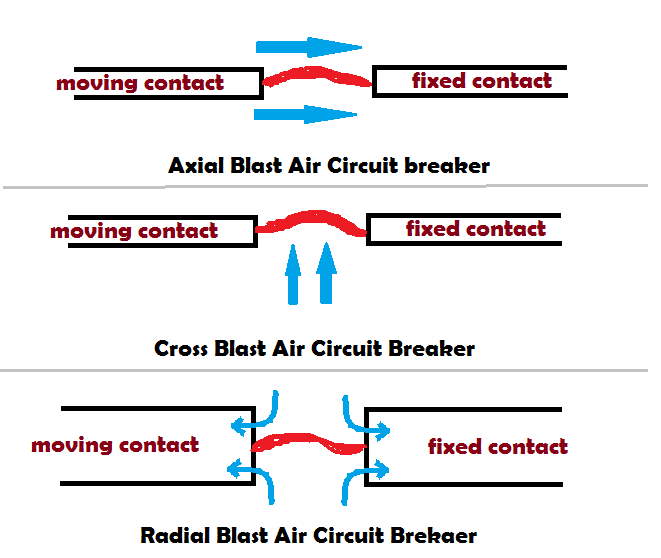 Circuit breaker employing double blast arrangement sometime called radial blast circuit, as the air blast flows radially into the space between contacts. Air blast circuit breakers finding their best application in system operating at 132 kV to 400 kV and above, specially where fast breaker operation requires. These are the high capacity circuit breakers and suitable for all EHV applications. 1. There is no risk of fire and explosion caused by oil. 2. The arc extinguished very quickly. 3. As the duration of arc is smaller, therefore burning of contacts is less. 4. Much less maintenance is required as compared to oil circuit breaker. 5. It has a relatively small size. 1. Compressor plant is required for compressing air. 2. They are very sensitive to variation in the rate of rise of restriking voltage. 3. Leakage of air at the pipe line fitting . 4. Due to poor dielectric strength of air it has relatively interior arc extinguishing property. 5. Cost of operation is high.